The Brawler™ FULL Width Rear Bumper for JK provides the highest ground and tire clearance possible in a full width JK rear bumper. This bumper brings Poison Spyder form and function to the overlander market, and to those who would like to keep their stock JK fender flares. The bumper extends to the full width of the stock flares, to integrate with them cleanly while protecting them from trail hazards. 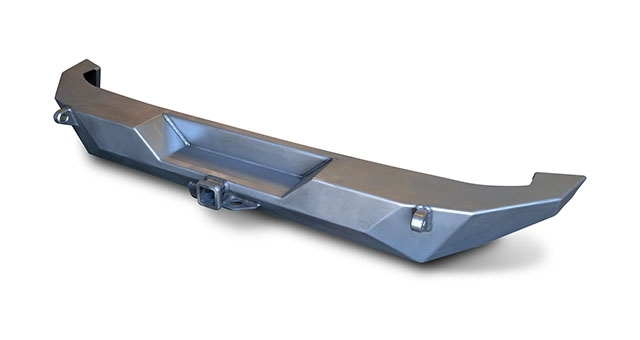 This configuration includes high clearance recovery shackle tabs and a receiver hitch. Like all bumpers in the Brawler product line, the FULL Width rear bumper is fabricated from 3/16" plate steel, CNC laser-cut and precision brake-formed into a low profile, high clearance design. This product ships as bare steel—it will need to be painted or powder coated prior to final installation.